Wilbur Cross’ Aniaja Ricks is fouled by New London’s KD Spencer Roman during the fourth quarter Monday. MADISON — New London coach Holly Misto has her team practice free throws diligently at each practice. Through three plus quarters in the most important game of the season thus far, the average fan would not have known that as the Whalers hit on just 7-of-22 from the free throw line. Luckily for Misto and the Whalers, freshman Joniyah Bland-Fitzpatrick and Jayden Burns converted when it mattered most. Connecting on all four free throws in the final 22 seconds of regulation, second-seeded New London rallied back to top 11th-seeded Wilbur Cross 51-47 in the Class LL semifinals at Polson Middle School in Madison. New London, ranked second in the GameTimeCT/Register Top 10 poll, will face top-seeded Norwalk, a winner over Hamden, in the Class LL final this weekend at Mohegan Sun Arena at a day and time to be determined. The trip to the finals will be the third in four years for the Whalers, who lost in 2016, before capturing the LL title in 2017 over Trumbull. After Cross (20-7) had a pair of opportunities to even the game but could not convert, New London iced the contest with a pair of free throws by Burns with 1.2 seconds to go. With the game even at 39 entering the final quarter and both teams in foul trouble, it was apparent the game would be decided at the foul line. With the Governors up by two points, they slowed the offense down and increased the lead to 47-43 on a bucket by Kayla Jefferson with just over two minutes to go. A basket by New London’s Burns was followed by two missed free throws from the Governors. Taina Pagan then evened the contest at 47 with 56 seconds to go for the Whalers. 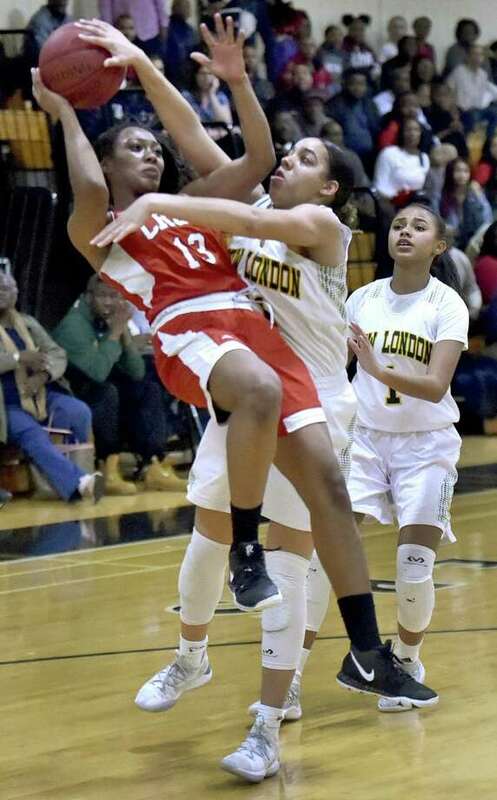 The heroics in the final seconds made up for what could have been missed chances for New London as the Whalers led 34-28 in the third quarter following a basket by Xaryia Melendez. Unable to extend the lead, the Whalers (25-2) watched as Cross used buckets by Tynisha Thomas and Jefferson to pull within 38-37, before a pair of free throws by Jefferson with 15.1 seconds left in the third quarter gave the Governors their first lead of the game. Cross struggled early against the size of the Whalers, trailing 12-5 in the opening quarter after New London converted from the free throw line. But, a basket by Kandie Everette got Cross within 16-4, and the Governors remained within six points the rest of the way until taking the lead in the third quarter. Burns had 12 points and Melendez 11 in the win for New London. Jefferson led Cross with 15 points, while Tyannah Tucker finished with eight. Taina Pagan — Finished with game-high 17 points for New London, including the tying buckets with 56 seconds to go.